How we live has a long-term impact on the environment and on our quality of life. With shortages of fresh water growing around the world, it is hard to ignore the threat that landfills, factory farms, and the use of toxic chemicals pose to fresh ground water. As energy costs continue to rise, we feel the impact of our nation’s rapid consumption of nonrenewable fossil fuels every time we fill up our gas tank or pay our utility bill. These are just a couple of examples of how our social, environmental, and economic systems are intricately linked. Adopting sustainable lifestyle practices at home and at work is essential for the health of the earth and for human flourishing. On September 12 – 13, Pure Hemp Botanicals™ will be participating in the 16th Annual Sustainable Living Fair at Old Fort Collins Heritage Park in Fort Collins, Colorado. We believe in the importance of promoting sustainability, and the goal of the Sustainable Living Fair is to teach people ways that they can adopt healthy, sustainable habits. From production to consumption, the paper industry has a surprisingly large impact on the environment. Paper mills consume a significant amount of energy and many rely on a toxic mixture of chemicals to reduce wood to pulp and bleach paper. Did you know that there are companies making high-quality paper from hemp? Check out the Living Tree Paper Company for more information about hemp paper. By doing these small things, you can play a role in reducing the demand for paper and decreasing the amount that ends up in landfills each year. Giving up bottled water and making a one-time investment in a reusable water bottle is a small change that can have a big impact. The Water Project has a collection of information about the incredible amount of waste produced by the bottled water industry and all of the natural resources it eats up. This simple switch could help save the planet as much as it saves you money. Growing your own food, without using herbicides or pesticides, is one of the greenest practices that you could adopt. Organic farming is far more than a fad. It protects people against health risks associated with herbicides and pesticides along with preventing the contamination of soil and ground water. Unfortunately, cultivating a garden isn’t realistic for many people. Luckily, there are a number of other ways to eat local, organic food. Farmers markets and CSAs (Community Supported Agriculture) are two of the best ways. Both give you direct access to the farmers so that you can talk to them personally about their farming practices to ensure that they are not using toxic chemicals. Their food is usually more affordable than the “local” and “organic” produce at grocery stores that may or may not live up to the label. Along with eating more local, organic food, you can help the planet and improve your health by cutting back on meat, fish and dairy products and adopting a plant-based diet. The livestock industry (which produces meat, fish and dairy) is one of the biggest culprits of land clearing, pollution, and greenhouse gas emissions in the United States. Scientific studies have demonstrated that plant-based diets can help to prevent chronic diseases. There are so many different dairy alternatives and lots of delicious vegetarian options that make a plant-based diet even easier to incorporate into your life. According to the Environmental Protection Agency (EPA), personal care products such as soaps, fragrances, and cosmetics are contaminating water in our country. Even low concentrations can affect aquatic life. Household cleaning supplies have an even greater impact: polluting air quality, contaminating water, and causing illness or irritation to humans. The EPA has even published a guide for buying green cleaning supplies on their website because of the importance of investing in non-toxic, green cleaning supplies. With the availability of excellent products like Mrs. Meyer’s aromatic and efficient cleaning supplies and Nature’s Root health and beauty products, there is no reason not to make the switch. As a consumer you have more power than you might believe. Large brands are starting to move toward more sustainable practices because of the increasing number of people who are seeking out products made with natural, non-toxic materials in ethical, green facilities. In the process, you will probably discover some exciting businesses that you hadn’t heard of before! According to CNN, the U.S. produces 250 million tons of trash a year that goes into landfills. While waste disposal companies are continually innovating to prevent that waste from leaching into the surrounding area, landfills still pose a serious hazard. As the world’s population continues to grow, it is even more important to cut down on our waste. The way to do this is to by reducing our consumption, reusing whenever possible, recycling, and upcycling (turning an old item into something new). While adopting these habits might take a while to adjust to, once they are a part of your life you will benefit from far more than a clean conscience. Reducing, reusing, recycling and upcycling will save you money and allow you to cultivate your creativity. You can cut down on your waste even more by composting. Composting allows you to recycle your own kitchen and yard waste to use as fertilizer. Dead leaves, table scraps, coffee grinds, and many other things that you would usually throw into the trash can be composted. This article is a fantastic resource for information for getting started. Use less water: take shorter showers or bathe every other day, wait until clothes are obviously dirty to run them through the wash, fill the sink with water when doing dishes instead of letting it run, etc. On a daily basis Americans utilize many different forms of transportation from escalators and elevators to buses and cars. All of these forms of transportation burn fossil fuels and produce pollution. Walking, biking, driving a hybrid, carpooling, and using public transportation are all excellent ways to reduce the amount of greenhouse gases you produce. By choosing to use the stairs instead of the elevator or deciding to bike to work instead of drive, you can improve your health along with diminishing your carbon footprint. 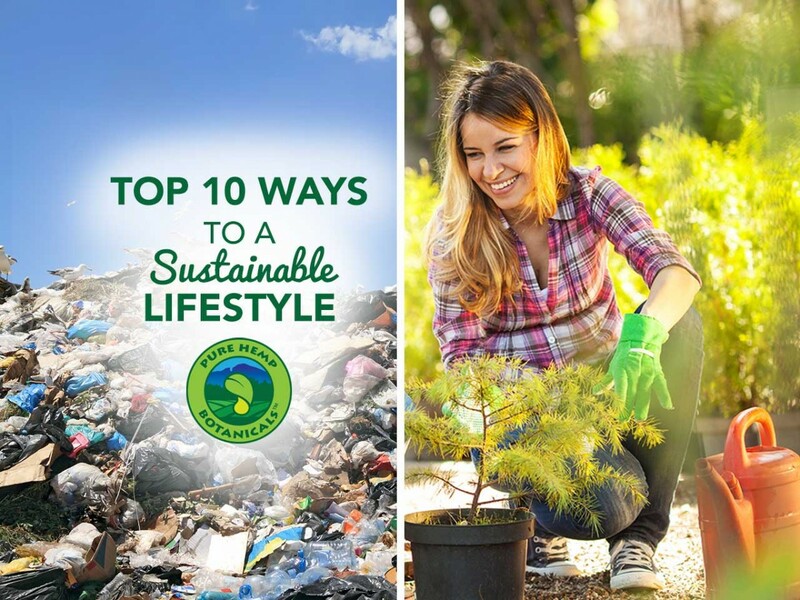 What are your favorite ways to live a more sustainable life? We’d love to hear them!